City Affiliation: Neriak. There are Teir'Dal Embassies/Outposts in Freeport and Gorowyn as well. Guild Heraldry: Long cloak with a darker blue crescent moon on a black background. Guild Facilities: The Fortress is located off the coast of The Commonlands in order to keep an eye upon New Neriak, Freeport, and Ancient Neriak. Embassies within Freeport and Gorowyn. There is also a theatre, library and other areas for use through the High Lady. ROLE IN NORRATH: Please see http://darkmoontower.shivtr.com/forum_threads/2222198 for our history. Darkmoon is the eldest army and family of Neriak. They have fought in many of the historic battles of Norrath and have been the House of Innoruuk's Champions in ages past. Religion/Philosophy: Innoruuk is the Father of the Chosen People of Norrath. Our Purpose is the Will. We shall unmake the world and see to the death and destruction of all things. Motivations: To turn others to Hate, to see the spread of the Will of Innoruuk. Disposition: Unlike most, we prefer to be a more intelligent evil than the common thugs most are accustomed to. Outlook: The Teir'Dal people have forgotten that they are superior to all others and have been corrupted by the weaknesses of the Hated Others. We shall be the purifying flame. We will cleanse this world of the filth and unmake it so our Father may delight in the destruction. Faction: The Impostor Queen of New Neriak, the Hated Others, Qeynos, all that represents the foolish belief in good and light are our enemies. Faction: Anyone who stands in our way is our enemy to be destroyed and raised as one of our Undead minions. Rumor: The High Lady of Darkmoon is part of the most famous of the Nerian fighting lineages. The fighting styles of the S'Lon line are legendary. Rumor: It is said that Darkmoon is where two of Innoruuk's Champions have been from. Darkmoon is favored by the Father. OOC Description: Darkmoon is one of the oldest RP guilds, having come over to EQ2 from EQ1. It was one of the first RP guilds formed on Xegony server and has managed to survive, thrive, and be an excellent RP guild. Like many guilds we've seen our hard times but we've moved past them and will continue to provide quality RP. We enjoy being part of the RP community on AB. While we may be IC evil SOBs, we are a good bunch who are friendly and helpful OOC. (Update 2018) I have kept the guild a bit quiet this year because of the passing of a close friend and one of my main officers early in 2018. 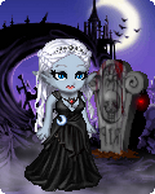 I've been working on decorating the hall, smaller RP events, and have had RL interfere so haven't been on much myself. This will be changing with the new year as I want to open recruitment again and not just be a place to park alts. I have done a purge because of this to our roster. Any questions or any who wish to re-join or join, may contact me IG or via our forums.